Three-way? (l-r) Vice Gov. 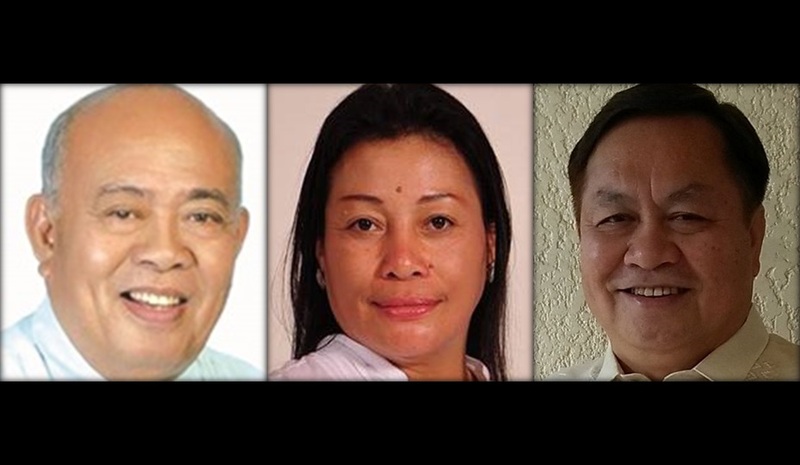 Dionisio Balite, former Carmen mayor Cheche Toribio and former Loboc mayor Leon Calipusan have emerged as probable candidates for the Third District’s congressional seat which will be left vacant by incumbent Rep. Art Yap next year. Less than a year before the 2019 midterm elections, at least three names surfaced as probables to run for congressman in the 3rd district. The district’s incumbent Representative Art Yap is on his third and final term as congressman. The names of Vice Gov. Dionisio Balite, former Loboc Mayor Leon Calipusan and former Carmen Mayor Cheche Toribio emerged as interested to run for the congressional seat. Balite is presently the provincial chairman of the PDP-Laban. Former Loboc Calipusan who is closely identified with Cabinet Sec. Leoncio Evasco, Jr. has not denied his plans to run for Congress. Calipusan’s supporters said the former Loboc mayor will no longer entertain of backing out once he can start moving around the district’s 19 municipalities. The third probable bet is Toribio who ran and lost in her bid for the said congressional seat and was also defeated in her ambition to become the first lady governor of the province. Yap who is reportedly eyeing for the gubernatorial post has not endorse any of the three. However, Yap was visibly seen and felt during the last barangay elections. In fact, reports bared that Yap met with the barangay leaders in their respective towns shortly before the election. Bohol’s political landscape has started to take shape in preparation for the election next year as the filing of the certificate of candidacy (COC) in October this year is fast approaching.